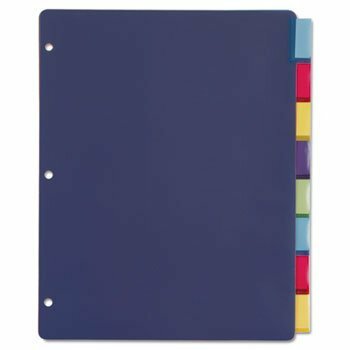 Extra-tough poly dividers pockets out perform regular paper pockets for binders - will not fray or tear out of rings. Scratch-resistant, transfer-safe poly - will not damage photos or transfer inks or toners. Single pocket on each divider. Extra large insertable tabs, includes paper inserts, tabs don't fall out. Scratch-resistant, transfer-safe poly will not damage photos or transfer ink or toner. Extra-tough--will not fray or tear out of rings. Extra large insertable tabs are designed so inserts won't fall out. Includes paper inserts.